There are adrenaline junkies, and then there is Denise Mueller-Korenek whose inner drive is faster than a jet plane at takeoff. 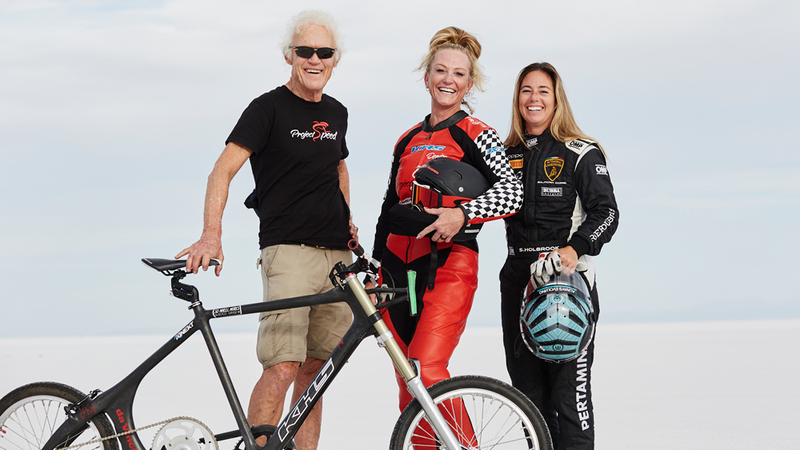 On September 16, 2018, the 45-year-old mother of three and elite athlete from Valley Center, California, shattered the existing bicycle land-speed record of 268.7km/h by hitting a mind-blowing 295.983km/h on her custom carbon KHS bicycle at the barren and blindingly white Bonneville Salt Flats in Utah. “Sometimes when it comes to reaching your goals, the older you get the more focused you become,” says Mueller-Korenek. Two years prior at the age of 43, Mueller-Korenek had grabbed the women’s world record when she hit 237.7km/h with her pace-car driver Shea Holbrook, also no stranger to speed as a seven-time Pirelli World Challenge winner. To achieve a land-speed bicycle record, a cyclist drafts, or rides, in the slipstream behind a motor vehicle to minimise wind resistance. 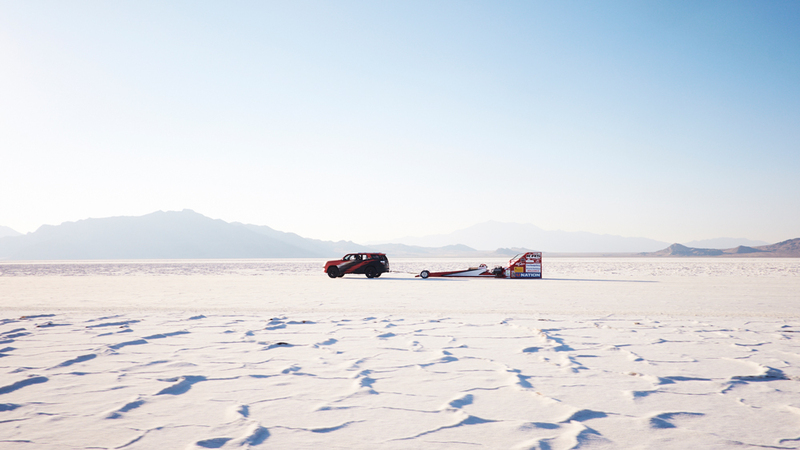 Mueller-Korenek’s bicycle, with its 2.1-metre elongated frame and extreme gearing, is tethered to the vehicle for about the first eight-kilometre race before she disconnects and takes over with her own power. 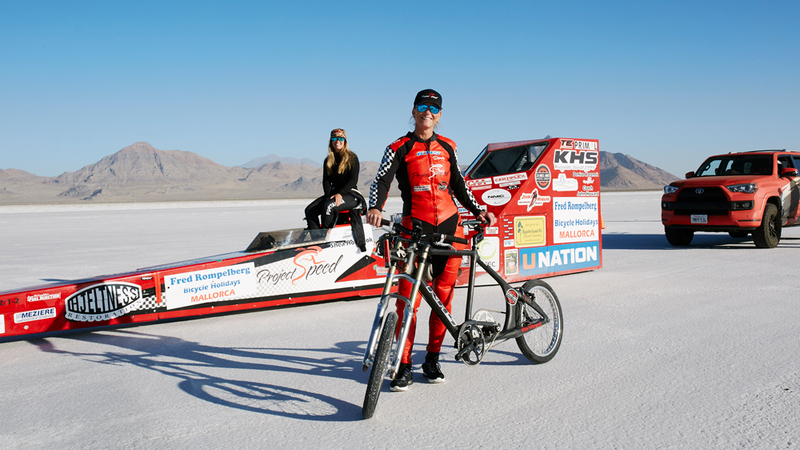 In 2016, for the women’s record, she pedaled behind a highly modified Range Rover, but knew she needed more horsepower and sleeker aerodynamics if she was going to chase the men’s record. And to do that she rehabbed the same 160km/h dragster that Fred Rompelberg used when he set the 167 mph men’s record more than 20 years prior. But riding behind the dragster also meant a considerably greater risk with a smaller draft pocket, giving her just 116 centimetres of lateral room to maneuver her bike.